This non-smoking, pet free, newly finished cabin which sleeps eight is nestled in the woods of Deerfield Resort surrounding beautiful Lake Norris. Amenities include Deerfield Cove Marina a few minutes away, a championship golf course in your backyard, airstrip, swimming pool, tennis court, sand volleyball court and a children's play area. Enjoy watching the deer walk through your yard while sitting on either the spacious upper or lower deck. After a full day of fun in the sun including boating, water skiing, tubing, jet skiing, or fishing, come home to a relaxing cozy cabin atmosphere including 1200 sq ft of upper and lower decking, patio furniture, stainless steel grill, ample parking with long driveway and additional parking area above cabin, full kitchen, two full baths, video game table featuring 60 classic arcade games, and FREE WiFi. Socialize with friends and family while preparing a full meal in the open concept fully equipped modern kitchen, which features stainless steel refrigerator/freezer, stove/oven, microwave and dishwasher, and granite counter tops. At the end of your day, relax in the large jetted tub located in the upstairs bathroom. Just like a hotel, towels, washcloths and bedding are provided for your convenience. Afterwards, enjoy a good night's rest snuggled in luxurious Egyptian cotton bedding. A full laundry room is available to you including washer, dryer, iron and ironing board. UPPER LEVEL: Queen bedroom, queen memory foam sleeper sofa, full bath, full kitchen, dining area, great room, full laundry room, deck. LOWER LEVEL: One bedroom with two queen beds, full bath, sitting area, walk out deck. Access to lower level via indoor spiral staircase or outdoor stairs. DEERFIELD RESORT: Guests have access to The Greens at Deerfield golf course (423-566-0040 for fees), Deerfield Cove Marina (423-907-9755 for slip rentals), swimming pool (no lifeguard on duty - children under 12 must be accompanied by adult), volleyball court, basketball court, tennis courts and children's play area. Some equipment for volleyball and tennis is provided at Deerfield Resort office but would suggest bringing your own. BOAT RENTALS: Springs Dock Marina (423-562-2405) is closest to Deerfield Resort and offers pontoon, ski boat, fishing boat and jet ski rentals. Marinas are open seasonally, usually opening mid May and closing in September following Labor Day. Springs Dock usually offers gasoline in the spring and fall seasons. COVERED BOAT SLIP: Rental includes a covered boat slip with power at Deerfield Cove Marina ($15.00 launch fee issued from Deerfield Cove Marina when entering with boat). FIRE PIT: Spacious stone fire pit (wood not included). GOLFING: The Greens at Deerfield offers a 6800-yard championship course designed by Bobby Clampett. A driving range and practice greens are also available. The club house offers a full service pro shop and restaurant. RESTAURANTS: The Greens Grill located in the clubhouse offers breakfast and lunch. The marinas of Springs Dock, Shanghai, and Sequoyah, and the Tiki Bar of Deerfield Cove Marina all have good food. McCloud Mountain Restaurant is a mountaintop restaurant that offers fine dining and a spectacular view which stretches as far as the Smoky Mountains; approximately 35 minute drive and reservations are required by calling (423) 562-3282. NOTE: The marinas surrounding Norris Lake are open seasonally, usually opening mid May and closing following Labor Day in September. If you are visiting in the spring or fall, please be aware that you need to bring all your food with you. There are restaurants and a Wal-mart located just off the exit from I-75. Tim and I live in the Cincinnati area and consider ourselves part of the "Ohio Navy" that invades beautiful Norris Lake every summer. We were hooked after only one trip to the lake! We have been married for 32 years and enjoy "getting away from it all." During our retreats, we have always found ourselves enjoying a cozy cabin in the mountains. We purchased Fair Haven in January 2015. When we walked through the door, we immediately fell in love and knew this was the cozy cabin that we were looking for. In January, 2015, Fair Haven was nothing but a shell of a house. It was a labor of love for us to finish the interior construction. Fair Haven is nestled in the woods surrounding Norris Lake. 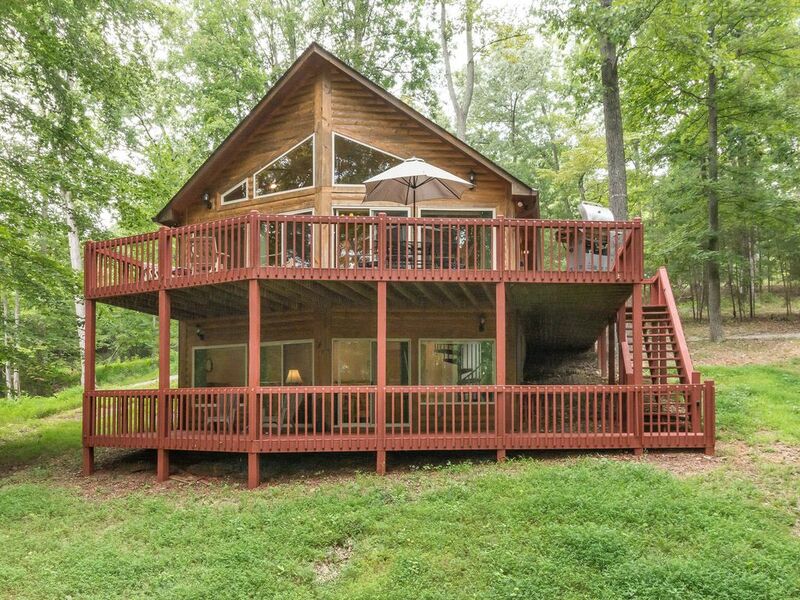 Sit on the spacious deck and enjoy a book while the deer walk through your front yard and the birds and squirrels play in the canopy of trees above you. SEASONAL LAKE VIEW - Our cabin is located in the woods. If you visit after the leaves have fallen, there is a lake view. If you visit when leaves are present, there is no lake view from the cabin. Owner supplies one packet of laundry detergent for one load of laundry. Instructions for operating washing machine posted on side of dryer. Flat screen TV, BluRay player, Cocktail table video gaming system with 60 classic games. Country table with six chairs - extra chairs in laundry room. Ample space for board games. Some board games provided by owner. Instructions for video games posted on wall above game table. Boat rentals at Springs Dock Marina or bring your own. Located by Deerfield Resort office. No lifeguard on duty. Children under 12 must be accompanied by an adult. The marinas surrounding Norris Lake are open seasonally, usually opening mid May and closing following Labor Day in September. If you are visiting in the spring or fall, please be aware that you need to bring all your food with you. There are restaurants and a Wal-mart located just off the exit from the interstate. Beautifully decorated for Christmas! Quiet and cozy cabin. Would love to come back during summertime! The photos don't do the property justice ! The decor is charming, furniture was comfortable, and the seasonal extras were charming. Great cabin! Updated and well equipped! We had a great stay at Fair Haven. It was the perfect place for our mini weekend family reunion. It was extremely clean, well furnished, and updated. We loved the fire pit, grill and outdoor space. It was well stocked with everything we needed! We loved seeing deer every morning and going on walks through the resort. You have a wonderful cabin. -padding on bottom of dining room chairs. We slept downstairs and it was very loud when chairs were moved. It was a nice place in a quiet area. Very nice property , had everything we needed to cook meals with ,super clean , all it could use is a hot tub on the deck ! Great cabin. Exactly as advertised. The boat slip at the marina is a great addition. Fair Haven is located on beautiful Norris Lake with a championship golf course in the back yard. Inside Deerfield Resort, there are additional amenities available. However, if you would decide to take a day trip, Knoxville is an hour away and Pigeon Forge is under two hours away. Bookings canceled at least 30 days before the start of the stay will receive a 100% refund. Bookings canceled at least 14 days before the start of the stay will receive a 50% refund. Rates subject to change. No Pets.